“I think the difference between the charter system and the public system, which is really what my book is about, is that the public system doesn’t really get rid of its students; they come back. The charter school doesn’t have the responsibility of serving the community and all of its children, so that what it’s trying to do is sort of slash and burn. Judging by the results, home-grown right-wing terrorists and extremists are a bigger problem in America than Islamic jihadis. They have killed more Americans, if you start the clock after 9-12-2001. And if you go back to 1865, when the KKK and similar groups were founded, the body count of death by lynching, shooting, and beatings is incomparably greater for racists and such than all the twisted followers of Daesh, ISIS, al-Qaeda or their ilk. This article is a somewhat detailed summary of the three major (and often overlapping) types of home-grown, right-wing, often racist American extremists that have been plotting to overthrow the government and to kill individuals they don’t like. Please read it and share. I’m going to repost in its entirety this article on Schools Matter about the double game that has been played by Randi Weingarten, the current president of the American Federation of Teachers. Posted by Mark Naison yesterday. Mr. Ahern provides important corrections to Weingarten’s sketchy assessment of AFT’s first hundred years. I am sorry to see he did not mention AFT’s seminal role in creating TURN in the late 1990s, a traitorous group that could not have been created without financial support from Eli Broad. I do not write to honor Albert Shanker and those who followed the course he took. It is my hope that through a full review of our AFT history, rational and thoughtful working people, acting in their own class interests, will conduct an internal critique, identify the wrong turns, and bravely set a new course for our union. It is my hope that current and future generations will overcome the seemingly willful blindness that is found in Weingarten’s article. Weingarten’s airbrushed history offers a textbook example of how to frame a narrative by omitting all evidence that contradicts her thesis. This method is not one of historical inquiry seeking educational enlightenment. It is the method used by a defense attorney to sway a judge or jury, guilt or innocence aside. In business and politics this is the method used to win market share, frame political campaigns and control the hearts and minds of the people. The sociologist and historian James W. Loewen has critiqued this method when applied to global and US history textbooks in his widely read Lies My Teacher Told Me: Everything Your American History Book Got Wrong (1995, 2008). It is a method that seeks to produce a generation that is misinformed, politically unaware, and lacking in self-knowledge and self-esteem. It casts pedagogues as society’s thought police. 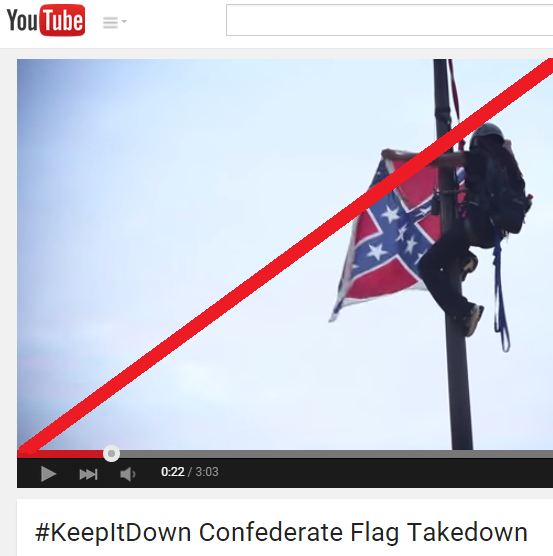 There is much in in AFT history that should be critically examined. When the full story is told it should include honest and in-depth criticism of key positions taken since Albert Shanker ousted his former mentor and colleague David Selden and rose to the Presidency of the AFT over two generations ago. The 1968 UFT strikes against community control, led by then UFT President Albert Shanker weeks after the assassination of Martin Luther King, Jr., became arguably the longest hate strike in US history and was part and parcel of the “white” backlash and neo conservative/neo liberal counter revolution which we still suffer from today. I was a high school student at the time in one of the community control districts where progressive teachers and students kept the school open during the strike. With community control ended decentralization still afforded parents the power to elect local school boards. Efforts by UFT members to interfere with minority parents voting in the 1973 District 1 school board elections on the Lower East Side were successfully overturned in Federal Court and upheld on appeal. To be cited in violation of the 14th amendment and the 1965 Voting Rights Act hardly constitutes an “honor” to be conferred upon a supposedly liberal northern city and a largely “socialist” union leadership that prided itself on its support for civil rights in the 50’s and early 60’s. I attended public school in this district from 1959 – 1971. Weingarten apparently missed this case while she “pored over” the AFT archives. The median salary for a NYC public school teacher in 2016, discounted for inflation and the extended day, is less than it was in 1973. Add to that the explosive costs of education and housing and it is fair to conclude that a teacher with 7 years on the job today is worse off than their counterpart was over 40 years ago. Top salary is now reached after 22 years on the job as opposed to 8 years in 1973. Even those few nearing retirement are just on par with their counterparts of 43 years ago. I ask President Weingarten the simple question: Who has the AFT been building “power” for? Surely the salary schedule is in the AFT archives and should figure in any assessment of the AFT’s “power” or lack thereof. The current wave of “Education reform” was launched with the 1983 publication of A Nation At Risk: The Imperative For Educational Reform towards the end of Reagan’s second term. For over 30 years the leadership of the AFT has been a partner in this latest wave of “education reform” and thereby maintained their “seat at the table” alongside the “reformers.” This is a matter of public record. When questions were raised that strongly contradicted the claims made by “A Nation At Risk” (see the Sandia Report, Bracey, Berliner and Bidell, Emery and Ohanian) the AFT and those closely associated with Shanker (including Diane Ravitch, then Assistant Secretary of Education in the Reagan Administration) chose to ignore and even suppress a devastating critique that potentially could have deflated the bubble of “reform” a generation ago (See http://projectcensored.org/3-the-sandia-report-on-education-a-perfect-lesson-in-censorship/ ). Comfortably based on the education reformers bogus critique of the state of public education and its politically motivated remedies, Shanker, Feldman and Weingarten are all on record in support of the “reforms” themselves: high standards for students and teachers, standardized curriculums, high stakes testing for students and teachers (for how else to measure whether the high standards are being met), charter schools (to counter the states monopoly over education and to give parents “choice”) and mayoral control in large urban systems serving predominantly Black, Latino and Asian students which has been the means through which “reform” was foisted upon school communities. Most recently, the “reformers” and their corporate cabal attempted to hoist the AFT on its own petard. It was only the death of Supreme Court Justice Scalia that averted a negative ruling in Vergara v California that would have done away with the agency shop. The stay of execution is only temporary, there are more cases to follow. Is this what Weingarten means by “building power?” Power for whom? Power for what? I challenge president Weingarten to go before any large urban local delegate assembly and defend the AFT’s record over 30 years in support of education “reform.” Does she have the gall to tell us to our face that school closings, privatization, elimination of sports, the arts, electives, vocational programs, attacks on tenure and seniority, the disappearance of Black and Latino educators, increased segregation, high stakes testing and value added teacher assessments are to be viewed as “collateral damage,” and not the central defining features of a neo conservative/neo liberal, corporate led consensus on the proper role and direction for public education? She wouldn’t do such a thing, so she redacts the record of AFT collaboration with the “reformers” and then presents herself as a teacher and student advocate. Teachers and their unions face grave pressures and are in a more defensive posture than they were 50 years ago. What power? What positive changes have been brought about? No doubt Weingarten and her supporters will point to the fact that teachers have a job with benefits and a defined benefit pension plan, a rarity now among US workers. What is the message here? Do senior teachers shut up and thankfully crawl to the finish line? Do new and mid-career teachers count their lucky stars that they are not suffering the same hardships that the majority of our students, their families and communities face? Is this then the real meaning of “professionalism;” to divide us from the rest of the working class? Should the membership cast a blind eye to the AFT’s quisling response to the neo conservative/ neo liberal consensus on education, the U.S. empire and the economy so that at least some of the so called “professionals,” (most importantly the paid staff and retainers at AFT Inc.) will be spared because the oligarchy has need of an ideological police? The isolated individual, teacher, parent, student, may opt to save their own skin when no alternative option is in sight, but experience shows that this is a losing proposition for the large majority. The greatest good for the greatest number comes not from dog eat dog competition, but from collaboration. Acknowledgement of this historical fact has led working people at important moments to embrace the fundamental credo of solidarity and act accordingly. Such a moment is upon us. There is no defending the AFT record of betrayal of this credo and the self-destructive impact it has had on the membership and the communities we serve. Weingarten simply casts a blind eye over what needs to be understood and corrected. If teachers applied this same method to reflect on our own classroom practice we would never learn a thing. I am reposting some ‘memes’ (pictures and quotes) of Martin Luther King, Jr that were made by Julian Vasquez Heilig on his blog, Cloaking Inequity. A young black woman climbed up the flagpole in Charleston and took down the Confederate flag, and was of course arrested, along with the young white guy who was helping her. Kudos to the two of them! Too bad they didn’t think to bring along some lighter fluid and a match as well – the flag of treason, racism, slavery and torture was treated much too gently, in my opinion. Let us remember the number of savage and barbaric lynchings performed in the American South from 1880 up to the year I was born (1950): almost four thousand. Let us also recall that every single one of these atrocities was undoubtedly committed by people who described themselves as god-fearing, upright Christians who were opposing the very second sentence of the Declaration of Independence, namely “that all men are created equal”. They were designed to terrorize the Black population of the South into submission, into not asking for equal rights, and to help reverse the results of the Civil War. 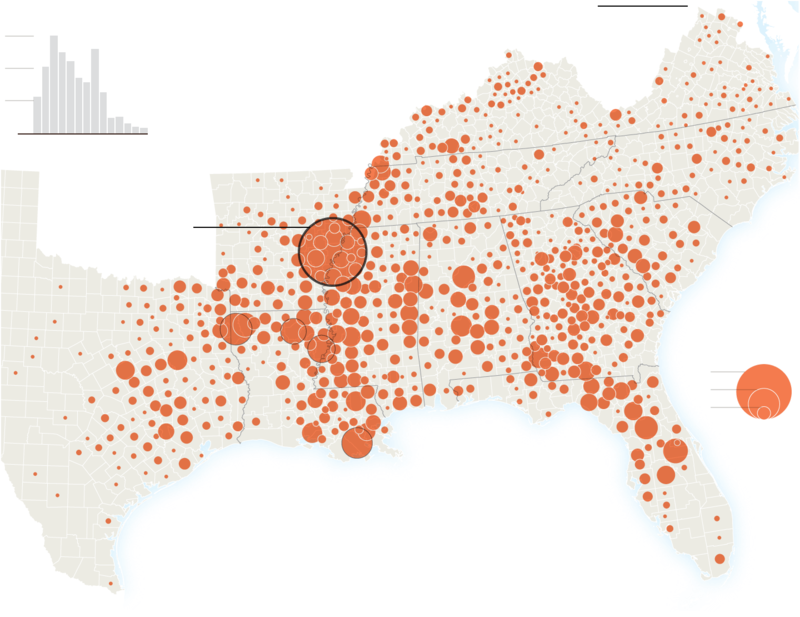 Here is the graphic from today’s New York Times showing where and when these lynchings occurred.